FYI, Gund Kwok will be performing at the Forest Hills Cemetery in Jamaica Plain tomorrow, July 18 at 7PM. The event is free and additional performances include drumming, Japanese dance and much more. It ends at 9PM. The Forest Hills Educational Trust is pleased to announce that the 15th annual Lantern Festival will be held on Thursday, July 18th (raindate: July 25). 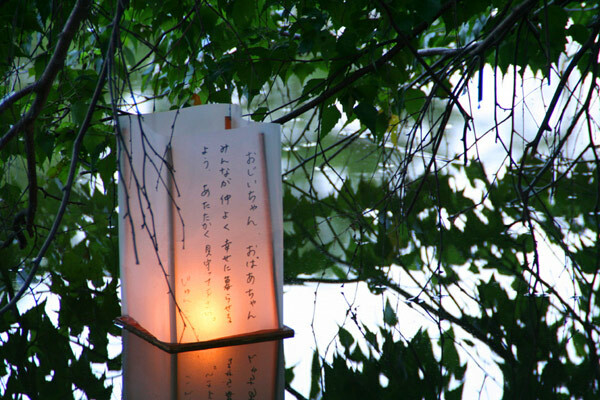 A much-loved community event for Jamaica Plain, as well as Greater Boston, the Lantern Festival draws its inspiration from the Japanese Bon Festival — a celebration each year when a door opens to the world of their ancestors allowing loved ones to send messages to the other side. It is a time when neighbors come together to share stories, celebrate, and honor the memories of loved ones. Enjoy multicultural performances and the warmth of the greater Boston community at this special annual event! For more information, visit The Forest Hills Educational Trust website OR read about it on Boston.com. 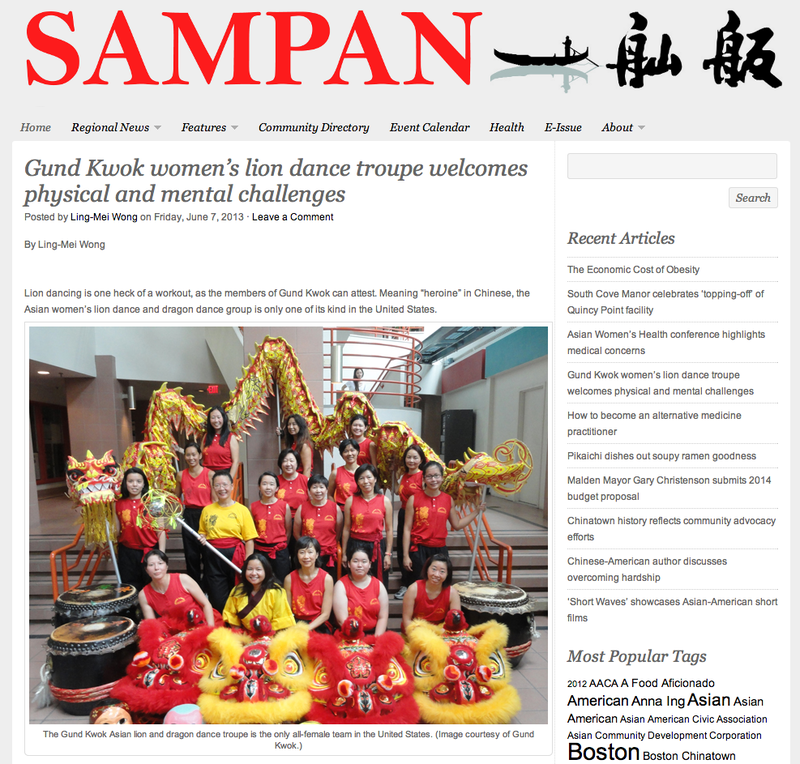 We were recently interviewed by Sampan Newspaper, New England’s Only Chinese-English Newspaper, for an article. Lion dancing is one heck of a workout, as the members of Gund Kwok can attest. Meaning “heroine” in Chinese, the Asian women’s lion dance and dragon dance group is only one of its kind in the United States. 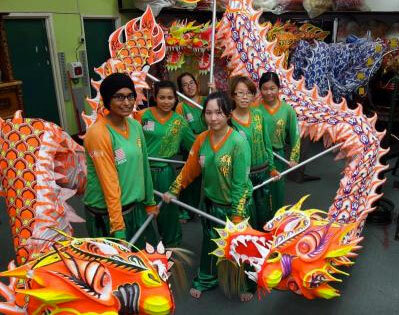 Founded in 1998, the group started with lion dancing and added dragon dancing. A total of 24 women are in the troupe, with a team for lion dance and another for dragon dance. Some women do both teams, Tan said. Lion dance involves two dancers, with one as the head and the other as the body, led by a happy “Buddha” representing a monk who tames the lion. Dragon dance has more dancers perform as the body, by carrying it on poles. Dances are accompanied by gongs, drums and cymbals to represent the lion’s fierce roar and frighten away evil spirits. The troupe practices weekly at the China Trade Building, 2 Boylston Street, to practice kicks, build strength and boost camaraderie. To sign up, women must enroll in a 10-week trial class. After learning the basics of lion and dragon dance, they perform a routine during their graduation and then decide whether to be a member. Members must attend 75 percent of practices and commit to a number of performances. Gund Kwok usually is invited to 18 to 24 performances a year, which depend on demand. Women volunteer; performance fees go toward equipment and charities that empower women and girls. “We want women to reclaim their strength and all of their abilities,” Tan said. Original article can be found on the Sampan website. TRAILER: Somewhere Between – A Feature Documentary from Linda Knowlton on Vimeo. My daughter’s name is Ruby. She is five. When my husband and I adopted her from China we had no idea what lay ahead. In an instant, we became a family. I began to think about Ruby’s future and started to wonder how her coming of age would differ from mine. SOMEWHERE BETWEEN tells intimate stories of what it is like to come-of-age as a trans-racial adoptee in today’s America, as examined through the POV of some of the 79,562 adopted girls from China. Through these girls we will explore identity, racism, and gender. Through the voices of these young women, we will see not just their lives, but our own, reflected back to us – whether we are adoptive families or not. SOMEWHERE BETWEEN will start a dialogue about what we see, who we are, and the changing face of the American family. This film is about the 79,562 girls growing up in America. Right now. If you have Netflix, you should definitely check this one out. I’m not gonna lie. At one point, I did cry. Our deepest sympathies to Mrs. Mah, godsons, Danny and Jeffery and the Penang Ching Xing Sports & Cultural Center for the loss of a great man and teacher on August 11, 2007. Our deepest gratitude to Master Mah Yook Seng for his expansive generosity of heart and mind. Even though we were strangers, Master Mah and Mrs. Mah graciously opened their home and the Cultural Center to Gund Kwok and made us family. 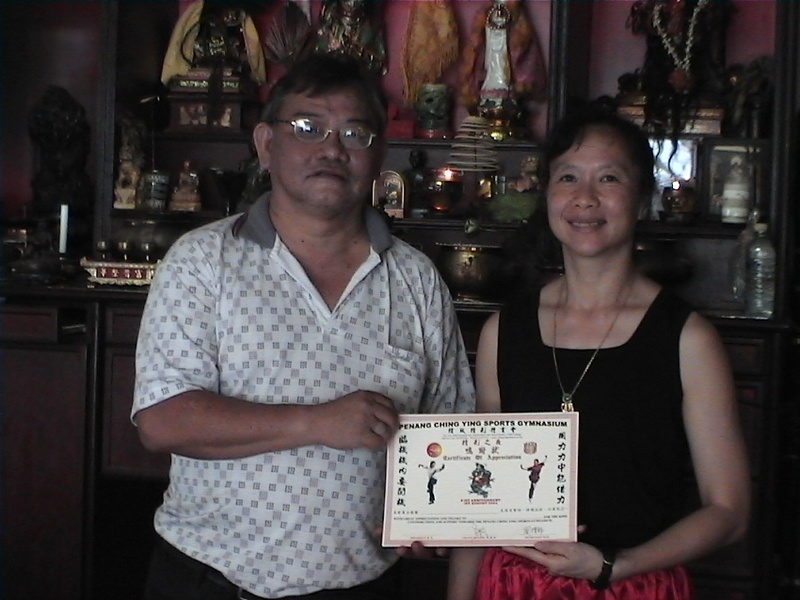 They offered us their wealth of wisdom and knowlege, teaching us everything we wanted to know about lion and dragon dance, and as much as our minds could grasp. We will never forget the many hours we spent together, talking, laughing, eating, joyfully delving into our common love of lion and dragon dancing and martial arts, and sharing our hearts and minds with each other. Master Mah is a beloved teacher, friend and mentor – his affecton and love will continue to sustain us. We will always honor, respect and hold dear Master Mah’s memory and teachings.